Royal W. Sorensen, AIEE President, 1940 - 1941, was a leader in the field of high-voltage, long distance electrical transmission, and he invented the vacuum switch for high-current electrical circuit. Sorensen was also worked as an electrical engineering professor at Throop/Caltech. Royal Wasson Sorensen was a leader in the field of high-voltage, long-distance electrical transmission, and he invented a vacuum switch for high-current electrical circuit. Born in a log cabin in Waubansee County, Kansas on 25 April 1882, he graduated from the University of Colorado in 1905 with a B.S. degree in electrical engineering. He then worked as a testman and a transformer designer for the General Electric Company in Pittsfield, Massachusetts. In 1910, Sorensen decided to leave industry and join the Throop Polytechnic Institute, which became Caltech in 1921. He taught electrical engineering from 1910 to 1952 at Throop/Caltech, serving as a lecturer, as a professor, and as head of the electrical engineering department. Sorensen researched for the U.S. military during World War I and World War II, and worked as a consultant for Pacific Light and Power, Southern California Edison, U.S. Electric and Manufacturing Company, and General Electric. A major proponent of graduate education in the engineering field, Sorensen conceived a plan for engineering graduate studies at Caltech. His dedication to Caltech and its students helped place the growing institution at the forefront of the advanced engineering education movement with a strong base in science and mathematics. Twice during his career, Sorensen traveled abroad at the behest of the U.S. government to help establish technological institutions in Japan and India. He was named professor emeritus in 1952, but continued to serve the Caltech community through his participation with volunteer, collegiate, and professional organizations. In addition to Sorenson’s role as an advocate of engineering graduate studies and his contributions to Caltech’s strong position in the science and mathematics fields, he was one of the first to envision the potential of a grid-system to convey electrical power in large-scale and long-distance transmissions. His High Voltage Research Laboratory at Caltech, the first million-volt, 60 megahertz lab with a two million volt surge generator, was the only one of its kind in the nation, offering a place where power engineering problems could be solved. Built in conjunction with Southern California Edison, the laboratory signified Sorensen’s premier position in the pioneering California power project and his vision for large-scale power engineering connections and grids. Sorensen designed the transformers used in the High Voltage Laboratory and conceived the million volt power’s flow through four transformers in a chain/cascade connection. The Hoover Dam project would attest to the importance of his guidance in the long-distance transmission of electrical current. In addition to his work with Southern California Edison and the High Voltage Laboratory, he invented a vacuum switch for high-voltage electrical systems in 1923. Although his invention would not become commercially feasible until vacuum technology and metallurgy advanced to state of reliability in the 1960s, the merits of Sorensen’s original invention would be recognized by the placement of his vacuum switch in the Smithsonian Institution in 1962 for permanent exhibit. Sorenson’s contributions earned him the Distinguished Engineering Alumnus Award from Caltech in 1966. He was also actively involved with the youth, was instrumental in establishing the Cal Tech branch of the YMCA in 1916, and served on its Board of Directors into the 1960s. Later in life, he became involved with air pollution control and sat on the Joint Research Council on Power Plant Air Pollution Control from the mid-nineteen fifties until his passing. 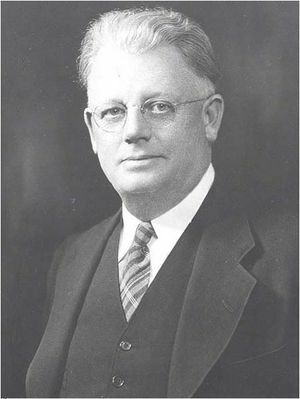 Sorenson was named an American Institute of Electrical Engineers (AIEE) Fellow in 1919, was AIEE president from 1940 to 1941, and Eta Kappa Nu named him an Eminent Member in 1950. He was married to Grace Milner, and they had four children. Sorensen died in his Pasadena, California home on 27 October 1965 at the age of 83. This page was last edited on 25 February 2016, at 18:51.